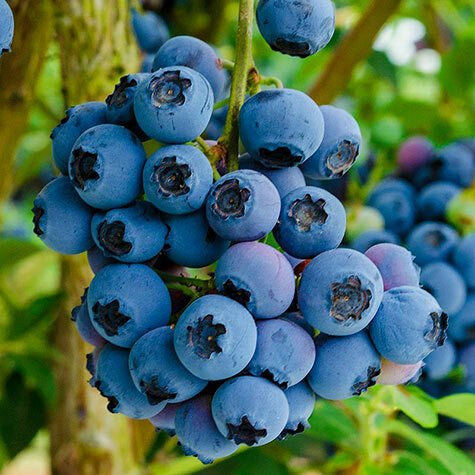 Adaptable to a wide range of northern climates and soil types, Reka Blueberry produces early-ripening, medium-sized berries with an exceptionally rich flavor and pleasing aroma. Surprisingly high yields and beautiful burgundy red fall color on this 4 -6 ft. bush makes Reka a must-have for every blueberry lover. Developed in New Zealand, Reka is a Northern Highbush variety that grows best in temperate climates where total winter chilling is 1,000 hours of more. Its fruits are excellent for fresh eating and processing. Vigorous and fast growing, Reka Blueberry is also a good choice for local farm markets and u-pick markets. Zones 4-7. Depth: Plant at the same depth as the pot. Water well. Pollinator: Semi Self-Fertile. Cross-Pollinate with other Northern Highbush varieties for greater yields. 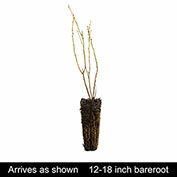 Foliage: Dark to medium green leaves, ovate to 3 inches long. A dramatic leaf display of burgundy-red Fall color. Fruit: Berries are medium sized, slightly dark in color, and have a pleasing aroma and sweet flavor. Flower Form: Urn or bell-shaped flowers. No fragrance. Soil Requirements: Adaptive to a variety of soils and climates. Pruning: Prune out leggy small twigs for bigger, better berries. 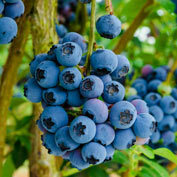 Blueberries should be pruned during the Winter while the bushes are dormant. In Winter, flower buds are easily visible on one-year-old wood and their numbers can be adjusted by pruning to regulate the crop load for the coming year. Comments: Very adaptable to a wide range of northern climates and soil types. Early ripening berries have an exceptionally rich flavor. Surprisingly high yields and beautiful burgundy red fall color on this 4 to 6 ft. bush makes Reka a must for every blueberry lover.